Big Ape City is a large urban area and a recurring location within the Donkey Kong franchise, which is said to be near the center of Donkey Kong Island. The name "Big Ape City" may be an allusion to "The Big Apple", a nickname for New York City. Big Ape City is the fourth and final world of Donkey Kong Land, and King K. Rool is ultimately fought at the end. 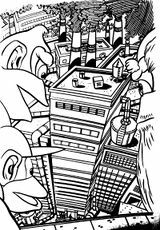 Big Ape City has seven levels, which are themed after high-rise buildings and construction sites. The world map also has a large blimp with DK's initials on them. In the 1995 chapter book Donkey Kong Country: Rumble in the Jungle, Big Ape City is said to have once been the largest city on Donkey Kong Island, and "the center of culture, entertainment and business". However, the city was gradually abandoned in favor of the surrounding caves, treetops and mountains. In the events of the book, Funky Kong flies over the city in his barrel plane with Diddy Kong, who sees smoke rising among the ruins of the city, although Funky doesn't wish to "go looking for trouble". After taking Diddy Kong back to his treehouse, Funky Kong flies over Big Ape City to pick up another passenger, although several flying pigs attack his plane and cause him to crash land. Donkey Kong, Diddy Kong and Cranky Kong decide to cross the island on foot. They use a cave route within a snow-capped mountain in order to reach the city. Upon arrival, they find that the city has been taken over by Kremlings, who have re-established themselves following the destruction of their old factory in the previous novel. It is revealed that they are building a new, larger factory under the direction of King K. Rool, who wants it completed by the end of the week. The Kongs are afraid of the amount of pollution that the factory is releasing. They overhear that Funky Kong is being held inside of the factory, and they proceed to overcome the city's "beefed up security" in order to help Funky escape, and to disable the city's security system. Within the factory, the Kongs overcome various different Kremlings, including Kritter, Krusha, a Klap Trap and Rock Kroc. After Funky repairs the engine of his barrel plane, the Kongs use it to escape the factory. Before leaving, Donkey Kong and Diddy Kong infiltrate the city's zeppelin, which is the "command ship" of King K. Rool. They plant the ship with time-delayed TNT Barrels, before escaping the city in their barrel plane. From afar, the Kongs watch the ship fall onto the factory, destroying them both. Amused about their victory, the Kongs return to their treehouse. Within the novel, Cranky Kong states that when he was Donkey Kong's age, Big Ape City was on the verge of being abandoned, as it was already "decaying and dangerous". Cranky also states that he has many memories of battling "a short plumber named Mario" within the city, which suggests that Big Ape City was where the Donkey Kong arcade game takes place. The first actual world of Donkey Kong for the Game Boy was called Big-City, and may be the same location. A snippet from page 15 of the Donkey Kong Land manual says: "Travel by zeppelin to Donkey Kong's favorite stomping ground, Big City. The sight of that familiar skyline might bring back fond memories, but don't waste your time sightseeing when there are Kremlings around!" The strategy review in Nintendo Power further states this with a screenshot caption stating "Cranky used to roll barrels at a plumber in the construction site here", being a direct homage to the the original Donkey Kong arcade game, though Mario was a carpenter in said game. The Metro Kingdom from Super Mario Odyssey has likewise been implied to be the place where Mario confronted Donkey Kong in the past, which implies that New Donk City has a direct connection with both Big Ape City and Big-City. This page was last edited on March 28, 2019, at 22:20.